The 8 Best Mini Golf Courses in New Mexico! There’s no handicap needed at these miniature golf courses around the state. The goal is just to have fun avoiding the artificial obstacles before you sink your putt. No worries about driving for the hole, all you need is a nice easy backswing and follow through for a hole-in-one. You might actually feel like you’re on a golf course here with real grass lined holes and bright green putting areas. Owned by a husband and wife team who’ve been entertaining families for 20 years, the course is well laid out with kooky handicaps and silly obstacles, like the castle you’ll play around. Daytime or evening play. Those with military ID get 10 percent off. Season passes available. Take a step back in time to the Jurassic period at a time when dinosaurs roamed. Be sure to take your putter, not for protection, but for some Dino Golf. In between the tyrannosaurus, stegosaurus and triceratops, you can whack a golf ball down some AstroTurf at this safe, clean and wholesome family fun place. Weekly specials include All-You-Can-Play Monday, Wacky Wednesday and Super Saturday. Group rates and party packages available. With three nine-hole mini courses, you can have a full day of golf here. Whether you play the blue, pink or purple lined course, there are plenty of challenges and fun times along the fairways. Whether you play as a team or solo, every stroke counts in this scramble down to the hole. Private party facility, arcade and snack bar with Pinky’s Italian Ice at the 19th hole. Wheel chair accessible. Grab your glow stick and your glow-in-the-dark golf ball and get putting on the 54 holes at this mall-based family entertainment spot. Yes, it’s in a mall but it’s a blast. Black lights illuminate walls with florescent jungle patterns and holes and obstacles with colorful contours creating an eerie out-of-this-world experience. Ball washing stations add a touch of authenticity to this activity. A fun place for group events and parties that will result in happy glows all around. 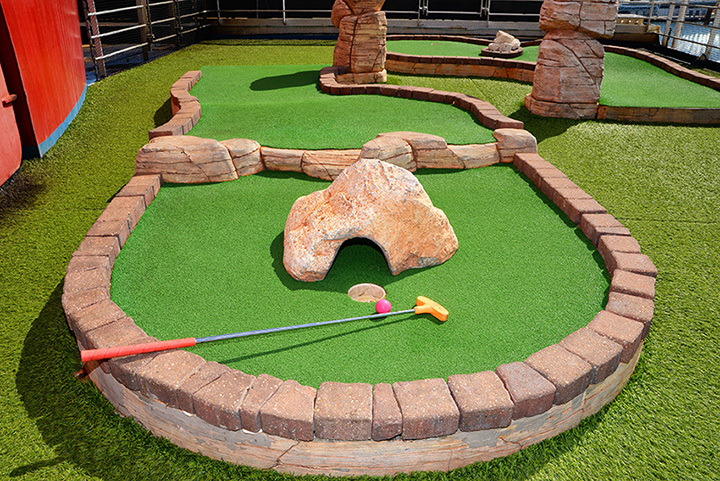 Whether you’re a pro or a duffer, playing on the two 18-hole mini-golf courses challenges your putting prowess. The course features hazards like tree houses, waterfalls, bridges, streams, fountains, trees and flowers, you have to navigate all the while trying to sink that hole-in-one. Daytime or night time under the bright fiber optic lights make this an any time of day destination. Packages for groups, parties and special events available. A snack bar serves up pizza, wings, hamburgers, hot dogs and drinks. Family fun for more than 25 years in this mountain resort town has to happen seasonally due to weather. But when the weather is good, this outdoor fun center is the place to be. The hike around the 18-hole course has its ups-and-downs … you are in the mountains … but the game pace is moderate enough to manage the hills. There are man-made water hazards to get across and long holes filled with non-traditional putting lines. Open from Memorial Day to Labor Day, seven-days-a-week. This one-time dance hall built in 1935 has been transformed into a family fun center, that’s also a lodge. It snows here in winter, so you’ll find both an indoor putt-putt golf course in this 15,000-square-foot playhouse and an outdoor one. Make memories on snowy evenings knocking a ball along the hardwood floors and around the cedar posts. It’s a new take on the game! The fun also includes skating, arcade games, pool tables and air hockey. This is a franchise that pops up in malls across the country. This particular mini-golf spot is in the Cottonwood Mall, north of the downtown section of the city. It’s a fun and relaxing way to take a break from the outdoor activities found throughout the region. You’ll find the same black light set-up that makes the glow sticks, glow walls, glow floors, glow balls and glow putters shine.